PRESIDENT STEPHEN MILLS welcomed members and guests. John & Gary from PALS and Bridgette & Bronte St Mary of the Angels students and Thang Dank. Multi District Conference commencing 15th February. Busy time: Art Show, Raffle, Business Breakfast, 4WD Trip, all require full club support. Bowl Scan Project Coordinator to be guest speaker 15th April. District Dinner in Blighty at 6.30pm. Next Meeting 11th February is a morning meeting commencing at 6.30 am at RSL Hall. RLI next rounf commence end February. Les Lawrence Shield 25th February. Rotary Foundation Dinner 16th March in Wangaratta. R.I. World Convention in Melbourne 2023. Grateful for friendship offered by Rotarians. Introduce guest speakers Bridgette and Bronte students from St Mary of the Angels who participated in the Alternate Schoolies Trip to the Philippines. GUEST SPEAKER: Bridgette and Bronte. Letter from Numurkah Primary School seeking support for an Indigenous Playground project. Thank you letters from Primary Schools for end of year scholarship vouchers. 32,000 tickets sold overall in the car raffle with winning ticket sold in Numurkah. Les Lawrence Shield bowls competition between the Nathalia and Numurkah clubs will be held on 25th February. Jade Connolly doing volunteer work at Koala Shelter. Kay Moodie undertook the watering of the Numurkah Secondary College garden during holidays. Rotary Friendship Exchange meeting in February. New board members met to plan ahead were in favour of hosting an Exchange Student. 4WD Trip has had good response for trip 29/30/31 March. Ride to Conference has 18 riders participating 15/16/17 March. On Friday ride to Strathmerton returning for dinner at the Telegraph. 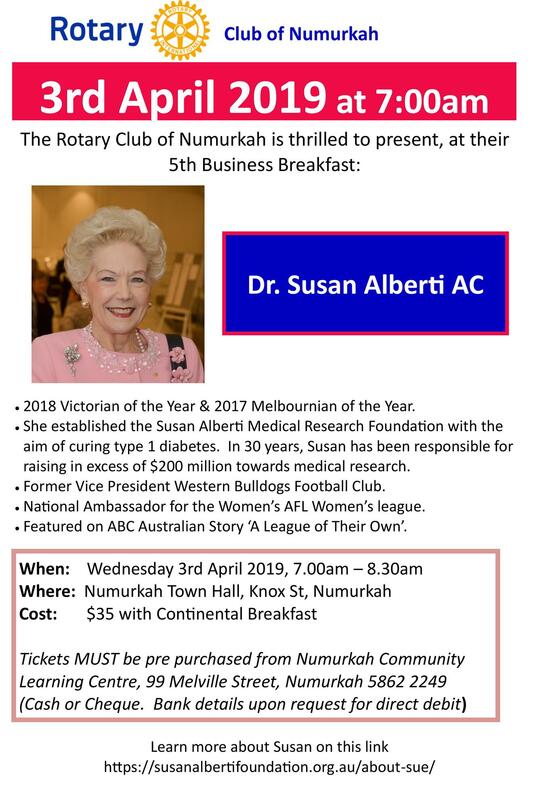 On Saturday 100km ride, with dinner to be hosted by Numurkah Club. Sunday ride to Nathalia then return with club to provide BBQ lunch. Linda introduced Elvis (John Read) and Gary from Pals. John went to the Elvis weekend in Parkes accompanied by Gary. And is planning on joining the Elvis Express train from Sydney to Parkes next year. Flyers now available to promote Business Breakfast on 3rd April. Birthdays Joan Barker 7th Pam Brennan 8th. Ernest Jones 34 years in Rotary.